← Should everyone learn to code? And should they learn it from Code.org? Are low-wage workers going to replaced by robots? There are cases being made for that happening, both here: The Shift From Low-Wage Worker to Robot Worker from FiveThirtyEight and from the recent book, The Second Machine age (pictured above). As well, some bloggers like Matt Yglesias have argued that fast food restaurants are a form of manufacturing, and this makes the notion of replacing fast food workers with machines more plausible to me. However, in considering this, it is important to look not just to the future, but also to look to the past. In particular, the past that contained the automat. 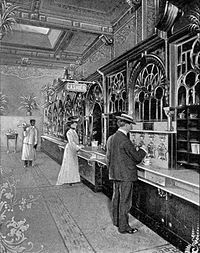 The automat was once the future too. There are still vestiges of them around, but mainly they have died off. They collapsed for a number of reasons (see Automat – Wikipedia, the free encyclopedia), but the chief reason was inflexibility. Today’s fast food establishments thrive on inflexibility and low cost. One way people can compete with that and win is with portable food (e.g., food trucks, food stalls). Barring bureaucratic costs, portable food is cheaper to deliver than when it is delivered by traditional bricks and mortar establishments (even fast food ones) and portable food vendors can be much more flexible than fast food places can ever be. There might still be robots delivering portable food, just like there are vending machines that provide food. But they won’t have flexibility of humans, and they won’t be as cheap. Additionally, humans can offer human interaction: no robot in the near future will be able to imitate that. I believe eating is a social act and a human act, and buying and selling food should be a social and human activity. We humans need to think about it in ways to provide it that doesn’t dehumanize ourselves. 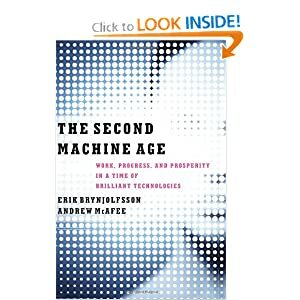 For more on the book, check out: Amazon.com: The Second Machine Age: Work, Progress, and Prosperity in a Time of Brilliant Technologies (9780393239355): Erik Brynjolfsson, Andrew McAfee: Books. It’s really great. This entry was posted in new! and tagged automat, automation, food, foodtrucks, future, robot. Bookmark the permalink.